Thom Radice's HO Scale W&A RR on RMC Cover! 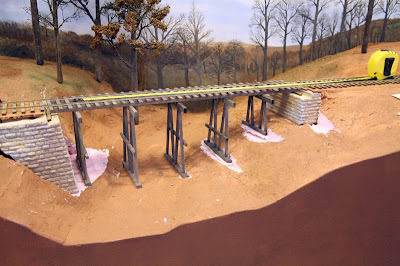 Here are some photos of the prototype Potomac Creek bridge. The top two are probably of the original bean pole and cornstalk bridge. One interesting thing about this bridge is that it uses different types of bents. Three of the center bents use the "w" configuration, while most of the other bents are more traditional three posts with diagonal braces. This is a good view of the surrounding countryside. Note the cut in the hill leading to the bridge site. In the background it looks like several units drawn up in formation in front of their camps. Note how neat and regular the ties are in this photo. Not your usual USMRR tree trunks and bark that you see elsewhere. 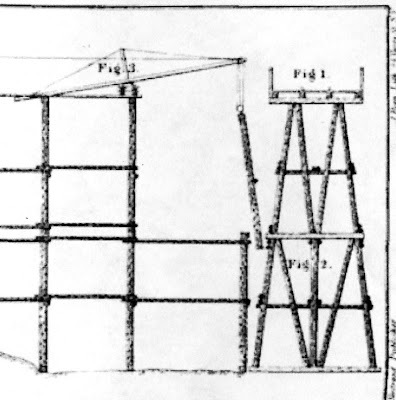 The pencil drawing dated April 1863 at the left shows scaffolding under the trusses, perhaps providing a hint on how it was built, but it's hard to tell for sure. 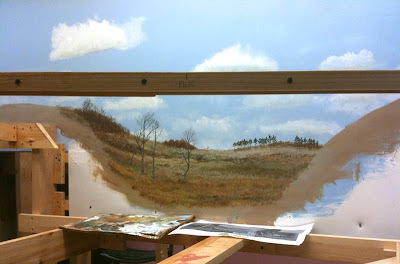 I skipped ahead of track laying to paint the backdrop behind the Potomac Creek. 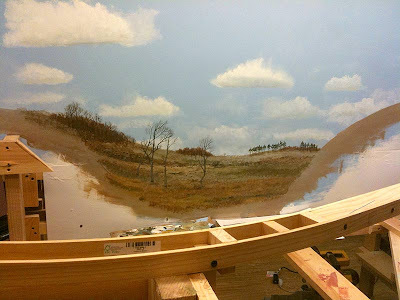 The scene is too deep t o reach from the aisle, so this section of the backdrop must be painted before the terrain forms are installed. I used some prototype photos to get an idea of what to paint. I made a quick sketch to layout the overall scene based on prototype photos of the area. The four trees in the painting were actually shown in a prototype photo. The wood piece visible in the photo is the stand-in for the Potomac Creek bridge. The track will be about 12 inches off the river bed in this scene, about 60 per cent of actual height. Next I adjusted some of the clouds on the backdrop, actually getting rid of some I had painted earlier. Then I started painting the trees and ground with acrylics. I painted a lot of tree stumps and brush on the ground, as the troops and construction crews heavily logged this area for lumber and firewood. In the foreground I used some brighter yellow toned down with earth color to add grass detail. In general I painted the backdrop trees a little bigger than before as I didn't want this scene to look like a deep mountain valley. It's really just a sharp ravine in some rolling hills. Next I need to paint the creek and the hill on the southern side of the creek. The creek will flow from the right to left on the backdrop, appearing from behind a ridge on the southern side (south is to the right on my layout.) When it transitions from the backdrop to 3D scenery it will meander back to the right, under the bridge. The complexity of this scene is really what lead me to hand paint, as I was not confident that I could achieve this level of perspective and view control with the printed backdrops. However, I plan to try the printed backdrops again on other projects. I just finished the drawings for etched O Scale switch stands and link and pin couplers. Several folks have asked for these, so hopefully they will work out. Once I get the test shots back and checked out, they will become new products for my company, Alkem Scale Models. The kit is based on the type of switch stand shown in these photos. The switch stand kits include four different style targets, bridles, rub plates, two and three way possible positions and even some scale spikes. If it works as designed, the switch stand kit will allow turnout control with all components "to scale." There should be no need for out of scale turnout bridles. All parts will be above grade for easy maintenance and scale appearance. They will work for On3 & On30 too with a simple modification to the bridles. Combined with autoreverse units on the frog, building and wiring a stub turnout will get a lot easier. 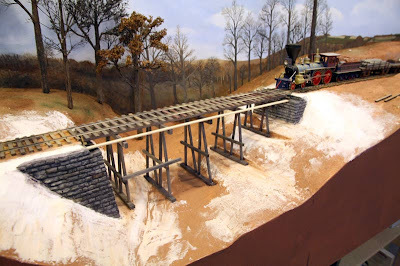 Secondly, I finally found a photo showing the "W" trestle bents mentioned in Haupt's book used in an USMRR bridge. It was in Racoon Gorge Bridge in Tenn shown here in a photo. The inset shows a close up of the bents. This bridge was designed by E. C. Smeed, who was one of Haupt's engineers in Virginia. He transferred to the western theater in 1864. Haupt in his memoirs claims that Smeed was the single person most responsible for the Union winning the war. Smeed never published his own memoirs, but Haupt includes a long letter from Smeed that Smeed's daughter found after he died. The letter describes some of Smeed's bridge building and other engineering activities in the western theater. He was too modest to have them published himself. The last big development this week was that we took delivery of our fourth engine from SMR Trains. This is a two rail W&A General. It is probably the most attractive of all the SMR engines. The triple domes, outside frame and dark brown/olive green paint is stunning. This photo is from SMR's website. I haven't had a chance to photograph the model on my layout yet. 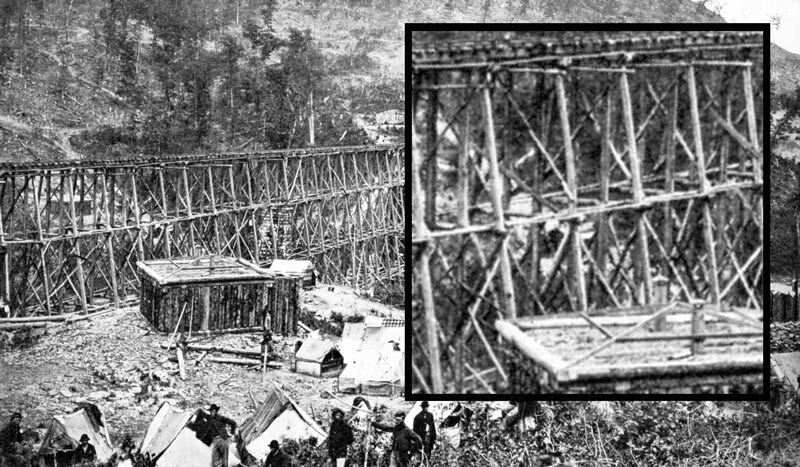 Here are some more photos showing close-ups of the Clairborne Run Trestle. I had a question about how I color the wood. Here is the process I used. I stained the wood parts after cutting them to size. When staining wood in a model kit, you must stain the parts before gluing. Any glue that gets in the wood grain will be too obvious if you stain after gluing. The second was a stain I mixed at home using a combination of household oil based white semi- transparent stain, tinted with burnt umber from a tube of stain tints and Minwax Golden Pecan. I thinned the mixture with acetone to make it more fluid. This stain created a real weathered gray color, but must be wiped off or it leaves a glossy buildup. So you can't apply it to assembled parts as it collects in the nooks and crannies where it is hard to wipe off. The Mt Albert stains can be added to a built model as they dry flat. Once the model was built and installed I drybrushed it with a light gray acrylic color called mushroom. It has a touch of green in it. It works well as a highlight color, better than plain white, which I find causes too much contrast. My experience in building military models taught me to weather everything via washes and dry brushing. This includes the trains, structures, carved rocks, ground cover, and even trees. However, I am very careful in drybrushing figures as the effect is easily over done. One must paint figures more carefully, but that is a topic for another day. Work on the trestle at Clairborne's Run continued this weekend. 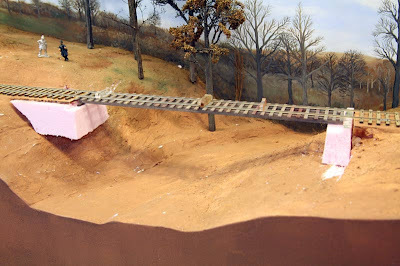 The bridge is now essentially done, with just the scenery and water to be added. The photos show the construction techniques I used. I made the abutments by cutting the basic shapes out of foam. I used my compound miter saw to get the angle for the battered walls. I spent a bit of time making sure the notches in the abutment for the stringers were properly sized to house the stringers. courses of stone lined up on all faces. Then I used Tamiya plastic putty to fill in the gaps and to help shape the cornerstones. Once that was dry, I filed the grout lines and stones to the desired shape. I sprayed the abutments with flat black, then a shot of gray from above. I dry brushed with a light color and washed with dilted black a couple times to get the effect I wanted. I carved the existing scenery to accept the abutments. This is where foam scenery excels. The bents are based on the design in Haupt's book on military trestles. He says that "W" shaped bents are preferred in military trestles as they do not require lateral braces. I have not been able to find a photo showing one of these in practice, but I went with the design from the book. The drawing here shows the bridge under construction using a crane attached to the built portions of the bridge to lift the next bent in place. In his text, Haupt says that they would prefabricate the bents and lift them in place. They avoided using pilings if possible to save time. So the bents rest on sills. He recommended using round "sticks," i.e. logs acquired locally. 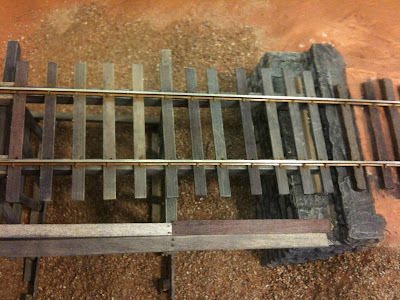 Since my railroad had a saw mill available, I used cut lumber for most of the bridge components, but I did use round sticks for the poles. I textured and tapered the pine dowels towards the top with a rasp . Here I am placing the bents in position. I made the bents on the work bench using a jig that I laser cut. I also cut all the poles to a precise angles on the laser. I drilled all the joints and pinned them with 0.015 inch phosphor bronze wire. For military bridges Haupt specifies using dowels, but I found brass rod easier. I carved some of the scenery away to accommodate the bents, this is appropriate for a bridge that used prefabricated bents. I later added small wooden retaining walls to hold the cut soil at the sill plate locations. They are not yet installed in these photos, but will be visible in the final shots. After removing the bridge parts, I used Fast and Final lightweight Spackle to fill in the gaps around the abutments and the bents. I think I should have used water putty as it is a bit stronger and sets faster. I added a two plank walkway along one side of the bridge as I have seen this is several photos. 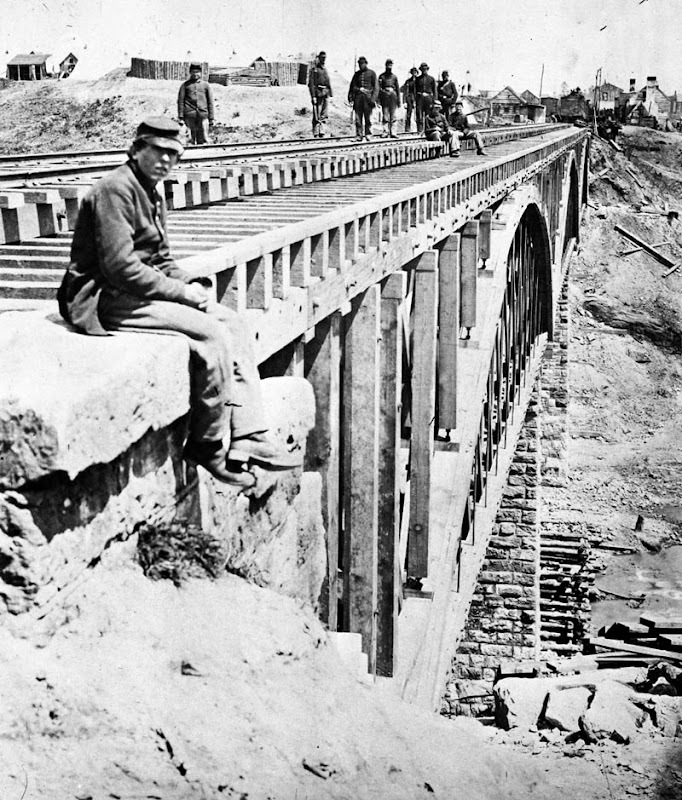 Haupt suggests planking over the bridge to allow horses and wagons to cross. I didn't do that here, as I assume alternate crossing sites are available nearby. I added some splice plates to the stingers to represent the fact that the stringer is several beams and not a single long beam. These received nut bolt and washer (NBW) detail. I also added NBW to the lateral braces. The iron bolts add a nice contrast to the wood and stone components. The scenery is nearly done. I still need to add the ground cover, vegetation and lastly, add the water. Then some sentries, tents and other details will complete the scene. One curious thing to note, the fascia and ground surface are painted the same color, but they look quite different in the photo due to the overhead lighting. In the actual room the colors are quite similar. Thom Radice has the cover story on his ACW W&A layout in the October issue of Rail Model Craftsman. The article has lots of great photos and a track plan. Check out the purple engine on the cover! Thom's scenery is some of the finest I have seen in an HO layout. He really has captured the feeling of the W&A before it was ravaged by the depredations of the war. The feature article is part of a special insert on period modeling, with other articles and ads for and about the early rail modeler. I highly recommend that you pick up this issue and let Carstens Publishing know that you enjoyed the special. After working backdrops for several weeks, I started again laying some track. Here are some photos showing progress between Falmouth and Stoneman's Switch. Gluing ties, adding rail and spiking. The track gauges are home made laser cut from acrylic. I cut the ties on the laser to have a rough appearance. They are 1/8th inch basswood. Then I stained them with a mixture of white, burnt umber and oak oil based wood stains. The white stain has some pigment that dries in an near opaque layer. I like the look it creates - a nice weathered look. 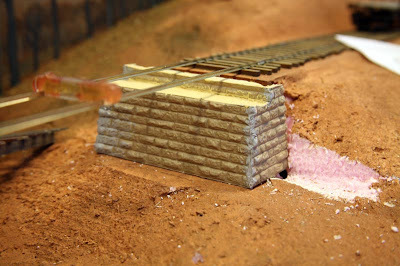 The turnout roadbed is a piece of 1/8th inch soft plywood cut with a hobby knife. I used the paper turnout template to get the right shape. A section protrudes at the lower right for the switch stand. This is not birch aircraft plywood, but a softer hobby plywood that is easy to cut with a knife. I used roadbed sections that I laser cut from 1/8th inch lightweight plywood with kerfs to make the curved sections. These get glued to the wood splines underneath. The bridge over Clairborne Run is starting to take shape. 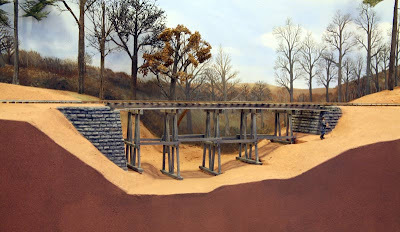 It will be a crude trestle made using the plans from Haupt's book on Military Bridging. The roadbed gets a coat of wood putty and light weight Spackle . After sanding it gets painted. Once the paint dries, the ties get glued down. This is the roadbed by Stoneman's Switch, a key point on the plan. There is one double ended and one stub siding here. 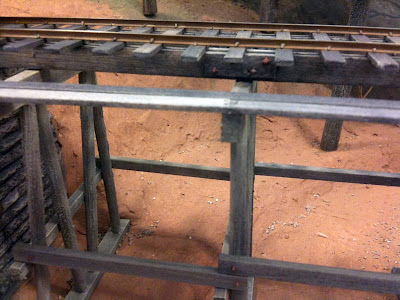 This is the primary passing siding on the layout. On October 3, 2009 I visited the site of the Potomac Creek Bridge while driving home from the ACW RR Historical Society Meeting in Petersburg and City Point, VA. At this time of year the site is heavily obscured by vegetation, especially by thick forest. 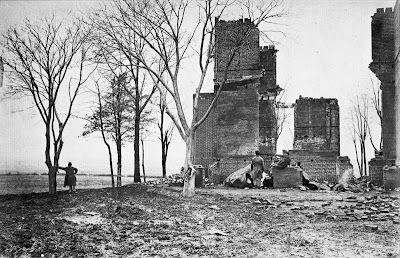 During the ACW, this site was completely denuded of trees by construction crews for materials to build the bridge and later soldiers looking for firewood. Not much remains from the Civil War era bridge. The RF&P built a new bridge just south of the old bridge in the 1890's. They used the same northern abutment so the original stone abutment was destroyed during construction. They slightly relocated the line on the south side, so that part of the original stone abutment remains. A public road now occupies the former right of way. There was no sign of the stone piers, but the foundations might be visible in winter when the trees are leafless. The cliff at the bridge site is quite steep, nearly vertical. It is a rock outcropping covered with a thick layer of dirt. It may have eroded some from the civil war era. I put together this short video documenting my visit. This image shows Phillips House with Lacy House and Fredericksburg in the distance. General Burnside used Phillips House as his headquarters until it was accidentally burned down by a careless soldier. As I think about the topography of my layout and the actual ground, I am beginning to believe that I should have Phillips House and not Lacy House on my backdrop behind Falmouth. My RR runs N-S with south to the right as you look at the backdrop. So the backdrop behind Falmouth should be to the east. Phillips House is east of the railroad, while Lacy House is west. But the RR makes a long Ess curve as it heads through Falmouth to Fredericksburg, so the views can be confusing depending on where you are on the ess curve. The town of Falmouth was actually about 1.5 miles northwest from the Falmouth Station. Karl Schwartz, a former guide at Lacy (aka Chatham) house, tells me that at Falmouth Station there was little development -most likely a few slave cabins and perhaps an overseer's house. There may have also been some service buildings for Lacy House. 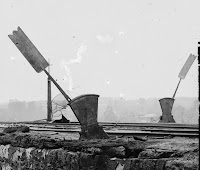 The Confederates burned the station at Falmouth when they retreated so it is charred remains at the time of Union occupation. It lies to the east of the tracks. So far I have not found any photos of the Falmouth Station and supply terminal area. The shot of the bridge is the best close up of the triple-arched truss at Potomac Creek I have found. This shot helps fill in the questions I had about how it was constructed. In the background, two freight cars are visible, implying that there is a siding just north of the bridge. That would most likely be the Potomac Creek Siding mentioned in several train orders and schedule for the line. I may combine this siding with Brooke Station on my layout as I don't have room for both sidings. Also visible in the background of the image are several log huts, and a fortification at the upper left to protect the bridge site. 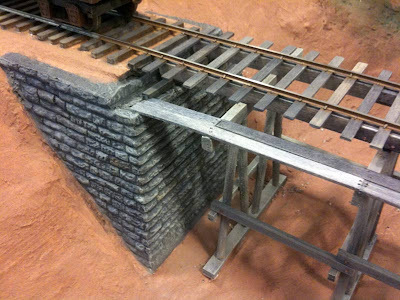 My layout design leaves a lot of room at the north end of the bridge to model some of these neat details.